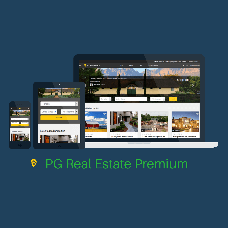 PG Real Estate Premium is the turnkey real estate website with mobile apps for the iOS and Android platforms plus pre-paid custom hours that you can choose to spend on any kind of modifications, from design to adding new features, to integrations with third-party services, payment gateways, and more. Use your property portal to showcase the real estate listings, capture leads and convert them into paying customers with the ready solution by PG Real Estate. The site can be fully rebranded so you get to maintain full control over all aspects of your site, including copyright, watermarks, and content. Responsive design for mobile devices will help your real estate site look good on old and new smartphones, tablets and other devices with various screen sizes. Every listing comes with a contact option. Your site visitor will be asked to sign up with their email address in order to get a response from you. It helps you get in touch quickly and follow up with more offers later. The property description may include photos, videos, a virtual tour of the property, floor plans, map and the street view of the area. You also get to manage numerous description fields from year built to appliances. Responsive means that your site will look great on both mobile and desktop devices. It is an advantage seeing as over 50% of all buyers use mobile devices for their home search. Apps are another way to make your listings available to the people. Push notifications are an additional point of contact. Your iOS and Android mobile apps will synchronize with your website database, colour scheme and settings. Optimize your real estate site to be indexed by the search engines with the built-in tools. Drive traffic to your site by launching online marketing campaigns and by sharing listings in the social networks. Create and post unique content directly on your site with the built-in tools in the control panel. It will help you establish your online reputation and rank your agency site higher in search results. You will work with your personal project manager. This amount of custom hours will let you create a unique website and adjust it to your niche ideas. Promote your brand, get leads, increase engagement, and grow your real estate business online!